Trade or professional publications are magazines, journals, and newspapers written for particular audiences. For example, Advertising Age is written for those in the advertising field, Mathematics Teacher for teachers of math, and Beverage Industry for those in the field of consumable beverages. In general, a trade publication will contain news, current events information, articles, and ads of interest to people in that industry or profession. Unlike scholarly journals, trade publications do not contain original research and are meant to be practical in nature. Their focus is on current trends and issues. How do I find articles in trade publications? Library subscription databases contain both citations to and the full text of magazine, journal, and newspaper articles. Kent Library subscribes to over 80 databases covering many different fields and disciplines. For Southeast students, faculty, and staff these databases are available (with login) wherever you have access to the web. While some databases cover a wide range of topics, many of our databases are devoted to a particular area of study. These more focused databases are called subject databases. Our focus here will be on several subject databases that cover business related topics. These databases will enable us to more easily find articles in trade publications related to specific industries and businesses. To access these databases, go to the Kent Library website, select the Find: databases link, and then select databases A-Z. Or, simply click on a database name above. Review how to search within this database. Select "Tips." Start searching by typing keywords for your topic in the search box. Identify the concepts in your search and put each in its own box. For example, if you are searching for articles on the topic of "trends in the automotive industry," input "automotive industry" in one search box and "trends" in another. You may also try synonyms, such as "car industry" for "automotive industry" or "future" in place of "trends." 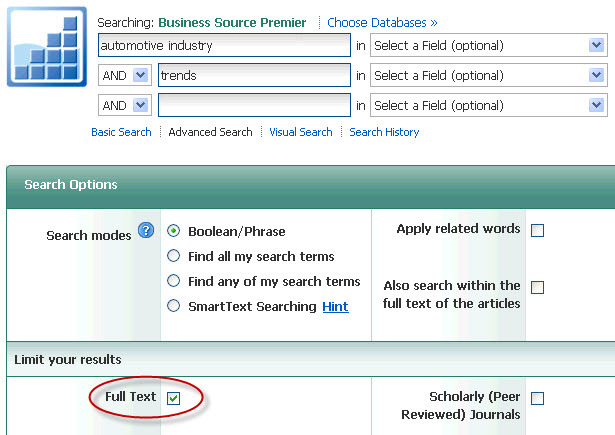 Limit your results to full text by checking the "full text documents only" box. Under Source type select "Trade Journals" in that menu box. Run your search by clicking the search button. Begin by reviewing how to search within this database, click the question mark. Start searching by typing keywords for your topic in the search box. Separate concepts and try synonyms, just as you did with ABI/Inform. Check the "Full Text" box. Under "Limit your results" pick "Trade Publication" as the Publication Type. Run your search by clicking the "Search" button. Start with a subject database. Review how to search within the database using the "Search Tips." Limit your search to "trade publications."